How to use published articles to create media wall displays. The other day I was retweeting a fantastic article from an outstanding blogger Carmen Sognovi you can see her blog @ http://www.carmensognonvi.com/ follow her on Twitter @carmensognovi. Her three part series on How to get publicity for your local business is wesome. And I thought "brillant" media displays I never heard that used before. Now you ask, what is so unique about a picture you hang on the wall? It's not just any picture! It's a news or magazine article and it will be customized in a commemorative frame to put on display. There is still something very authentic when you or your business has been featured in a print publication, very favorably. Yes taking the article and posting on your social media accounts and maybe linking it to your website our all fantastic ideas and we highly recommend doing this. How about displaying your media front and center a real attention grabber. 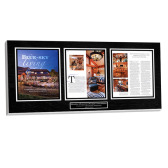 Media display plaques detailing your company’s success would look great hanging around in the office. Not only will it spice up the room with a little decoration, it will help boost employee morale and let them know their hard work and accomplishments have paid off. It might even look more impressive to a potential customer who has had the chance to glance around the room and admire all of your company’s accomplishments. Getting started is as easy as filling out a simple form and hitting submit. In 5 minutes you will be on your way to creating your own custom plaque for your company. There are plenty of style and color options to fit any office building. With our policy you are not obligated to pay a dime unless you are satisfied. We will send you the plaque to inspect free of charge, and if it fits your needs, you can pay online. If you are not satisfied, let us know and the return shipping will be on us. Before you get started, be sure to check out one of our many samples on our website today. If you have any questions, our friendly staff is always happy to help. You can contact us @ www.inthenewsonline.com or 800-548-3993 to see more great examples you can always use our get started button below.